London Underground Vs Toronto Transit Commission: Which Is Better? 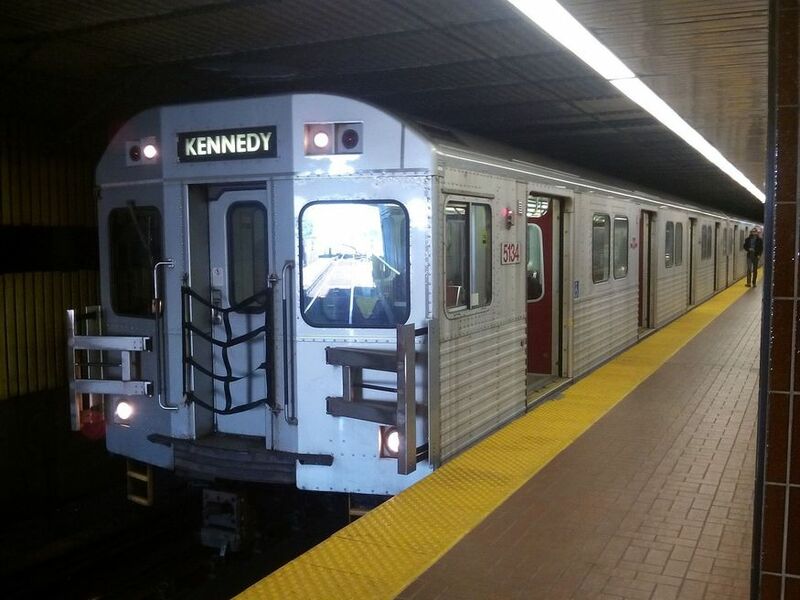 Tabish Khan London Underground Vs Toronto Transit Commission: Which Is Better? Here at Londonist we love pitching other underground transportation networks from across the world against the venerable tube. We've already compared it to transit systems in Moscow, Beijing, Tokyo, Paris, New York and Munich. Now it's Britain versus Canada in what promises to be a very polite showdown. The metallic Toronto trains. Image: Creative Commons licence. The London Underground is vast and covers most of London. But Toronto's subway is nowhere near as comprehensive with just two lines — one going across the city and one that does a North to South U shape through the centre of the city. There are two smaller bolt-on lines, but they're better classified as extensions to existing lines. Thankfully Torontonians are well served by buses and streetcars (trams) so they aren't reliant on the subway entirely. However, we're only comparing Underground systems so we can't count the fantastic streetcars in Toronto's favour. No night tube in Toronto either. Result: An easy victory for the more comprehensive London Underground. Anyone visiting Toronto in summer will be glad to see all the trains are air-conditioned, though London is (very) slowly getting there too. As an aside, the air con on Toronto's streetcars works too, which is more than can be said for London's Routemasters. Many of Toronto's trains have light up maps showing which stops is next — handy for anyone who doesn't know their way around the city. It's a system we've seen in many other cities, but there's no sign of it on the tube. Toronto's trains have a metallic look, reminiscent of the the New York subway, though the trains are much cleaner than those in NYC. The priority seats are often a different colour — a nice touch — so it's clear when you're sitting in one. No pretending you haven't noticed when a pregnant woman needs a seat. Result: We're giving it to Toronto. It has its charm. Image: Creative Commons licence. The tube map is a design marvel and the roundel is a beacon to the lost traveller. While the Toronto Transit Commission (TTC) logo does have a classic charm to it, one bugbear is that it's the same logo for all forms of transport, so you could be heading for what you think is a subway station but turns out to be a bus stop. TTC is the equivalent of TfL, but TfL has different coloured roundels for each mode of transport. A similar approach from the TTC would have made it much easier for this tourist to navigate Toronto. Result: Nobody messes with our roundels — a win for London. There's a flat fare for travel in Toronto, with no zones to worry about. The weekly travelcard is cheaper in Toronto at around £26 compared to London's £34.10 for a Zone 1 travelcard — so Toronto wins, even if we just stick to Zone 1. Plus a shade under £2 for a single means Toronto has London beat. TTC also has the equivalent of our hopper fare if you transfer routes, but it works across all TTC transport options, making it more useful than London's bus hopper. The downsides are that Toronto relies on tokens and cash fares still, though it is transitioning to a Presto card which is pretty much a carbon copy of Oyster. However, one significant flaw remains in that weekly travel passes are only valid Monday to Sunday, and monthly passes are only valid during a particular calendar month. It's a system that is particularly annoying for any tourist who arrives mid week, or even native Torontonians who want their week to start on a Wednesday (and just think of the Monday morning/1st of the month ticket queues if this were the case in London). We imagine it's an IT system constraint, but one that's far from ideal. Result: Toronto is cheaper (isn't everywhere) but the lack of flexibility in ticketing means we're calling it a draw. A nice touch at Museum station. This category is always a walkover for the beautiful tube, which is the oldest Underground network in the world. Toronto's subway is a post-war construction and while the stations are functional, not much really stands out for us in terms of design. 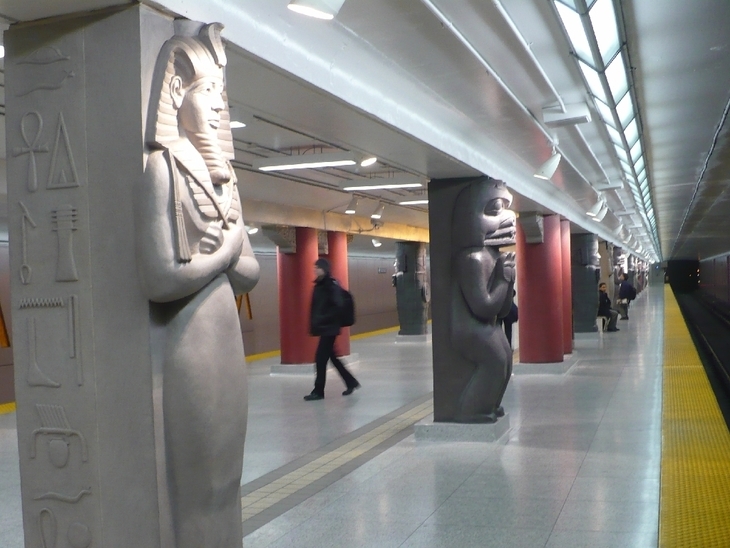 The one exception is Museum station, where the pillars are carved in the styles of different civilisations including Egyptian, Toltec, Greek, Chinese and First Nations (those peoples who were originally native to Canada). Result: A walkover for the London Underground. It's a 3-1 win for the London Underground. It's probably unfair to compare Toronto's much smaller network to ours, and TTC was always going to be the underdog. However, we fell in love with the streetcars and we'd always put them above London buses, and our own tram network.